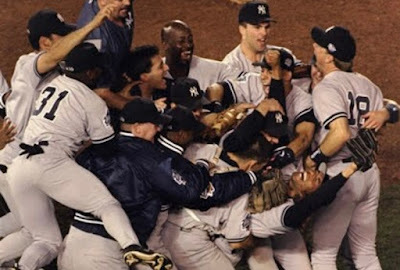 From now until the end fo the season, we will be tracking the progress of the Yankees with their 1998 World Championship team that won 114 games in the regular season. The Bronx Bombers were at it again on Saturday night, as Miguel Andujar hit a two-run home run in the third inning, and Giancarlo Stanton hit a two-run shot of his own in the fourth inning that gave the Yankees a 4-1 lead. Aaron Hicks had a pair of RBI singles, and Andujar had an RBI double in the eighth inning that made it 8-4 Yankees and put the game away. Masahiro Tanaka got the win, as he went 5 1/3 innings, allowing four runs on eight hits, including three homers, and a walk, with seven strikeouts. Hideki Irabu earned his fifth win of the season, as he went 7 1/3 innings, allowing one run on six hits and four walks, with six strikeouts, to lead the Yankees to a 6-1 win over the Devil Rays. The Yankees jumped out to a 2-0 lead in the bottom of the second inning, as Darryl Strawberry had an RBI double, followed by a run coming in on a Joe Girardi groundout. After Tampa Bay got a run in the top of the third on a Quinton McCracken groundout, Bernie Williams had a two-run single to make it 4-1 in the bottom half of the frame. Paul O'Neill hit a home run in the seventh inning to make it 6-1 Yankees. Dennis Springer took the loss for Tampa Bay, and his record dropped to 2-9 on the season (he finished 1998 at 3-11) with a 5.43 ERA. Springer pitched seven innings, allowing all six Yankee runs, on 10 hits and three walks, with three strikeouts. Where they stand: The 2018 Yankees (37-17) are four games off the pace of the 1998 Yankees, who were 41-13 through 54 games.